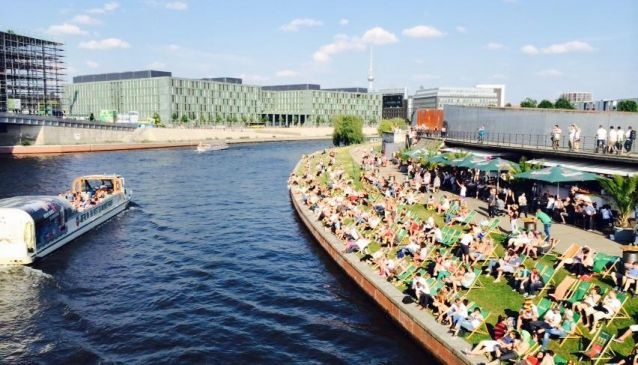 With deck chairs lined along the green grassy banks of the River Spree, you can sit at the Capital Beach bar in Berlin and lap up the sun with a beer, wine or cocktail. All this whilst you people watch all the new arrivals from the Berlin Hauptbahnhof train station, or wave at the boats that float past you, usually they will wave back too. You can choose from up to 60 different cocktails and listen to music from well known house DJ's, plus they offer a good selection of food, snacks and specials. A beautiful view by night as well, it's worth a visit here in summer, if you can get a seat!